So here it is! The first antique garment I ever purchased, around age 13. While she’s not something I would probably buy now (though, maybe for the price, I would buy her again), I will continue to care for her. I actually have a few other pieces that belonged to the same woman which I will post later- a shawl, a skirt, and a bonnet. The dress is made of a separate skirt and bodice that hook and eye together. 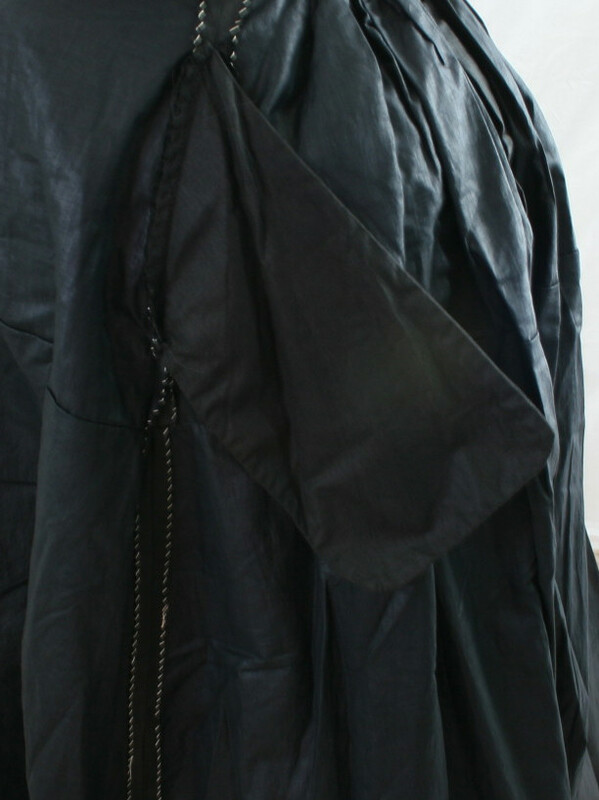 She is made of silk twill, with cotton lining, wool hem tape, and a silk and cotton chemissette. She is trimmed with silk velvet and soutache. 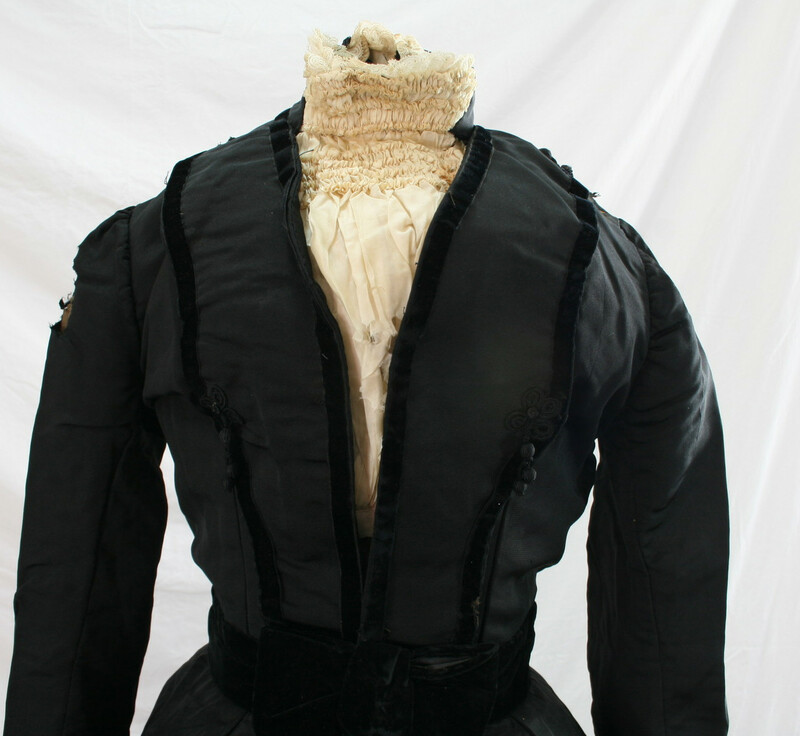 The chemisette at front is made of a fine silk on a white cotton back. It is hand sewn with eight gathered tucks. The collar with lace at the top is a separate piece attached to the collar of the dress. 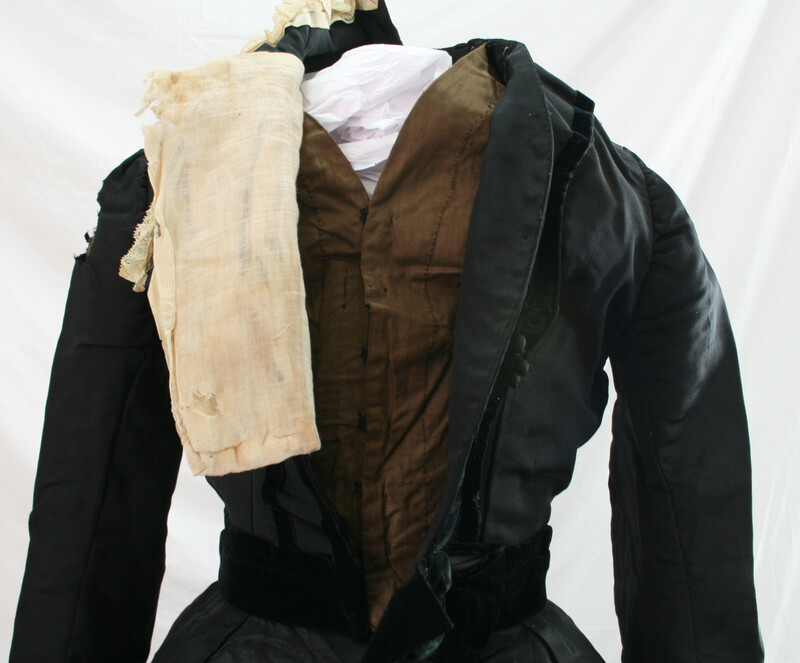 The back of the skirt is still slightly bustled, and a small bustle pad was likely worn with this dress. There is one tuck in the skirt going all the way around, about lower-thigh height. 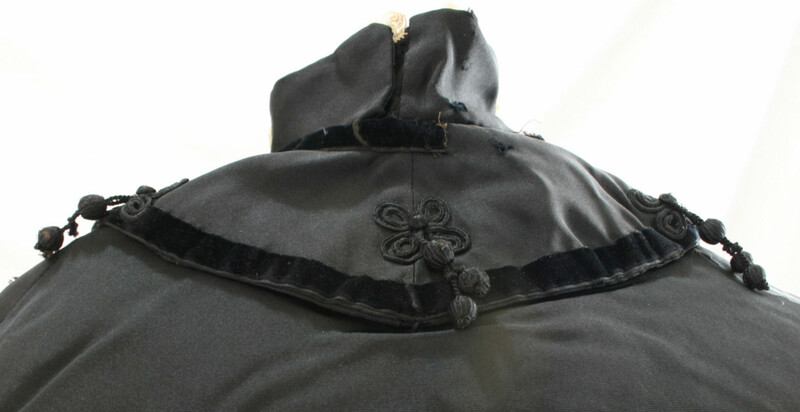 The silk velvet is a ribbon, except for the attached belt and bow, which is pieced velvet fabric. The waist is 26 1/4″. I haven’t been measuring height on each garment, but this one is noticeably short… this lady would have been a bit under 5 ft. 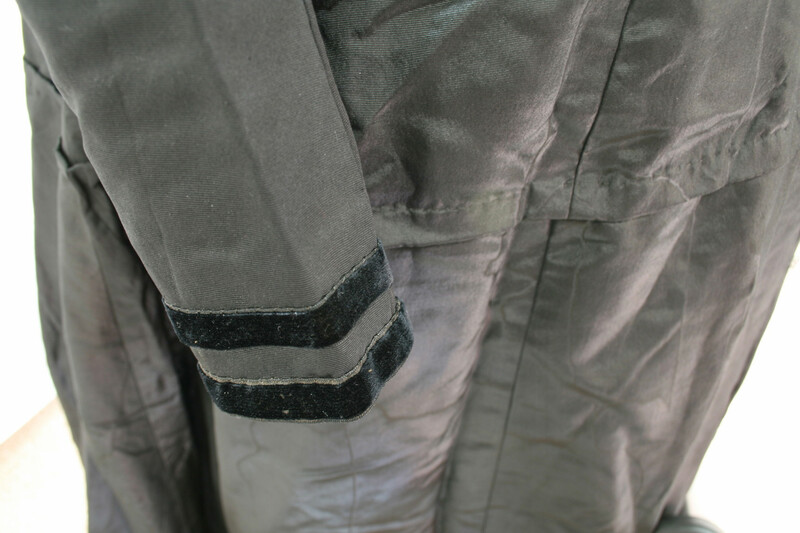 Detail of the silk velvet at the cuff, as well as of the skirt tuck, which is sewn by hand. 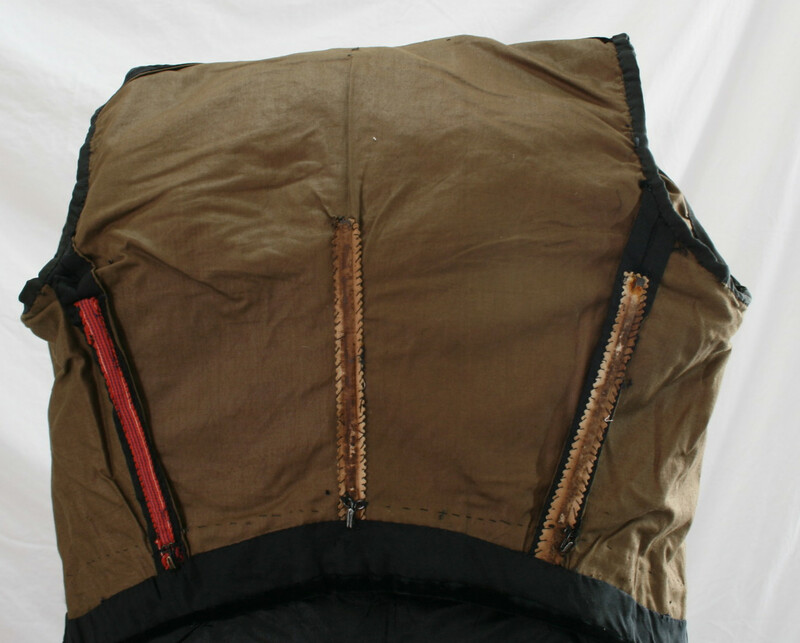 Interior of the skirt, which is fully lined in black cotton. The hem is finished with wrapped wool hem tape, and there is an interfacing in between the fashion fabric and the lining at the hem. The seams are overcast, and there is a pocket. 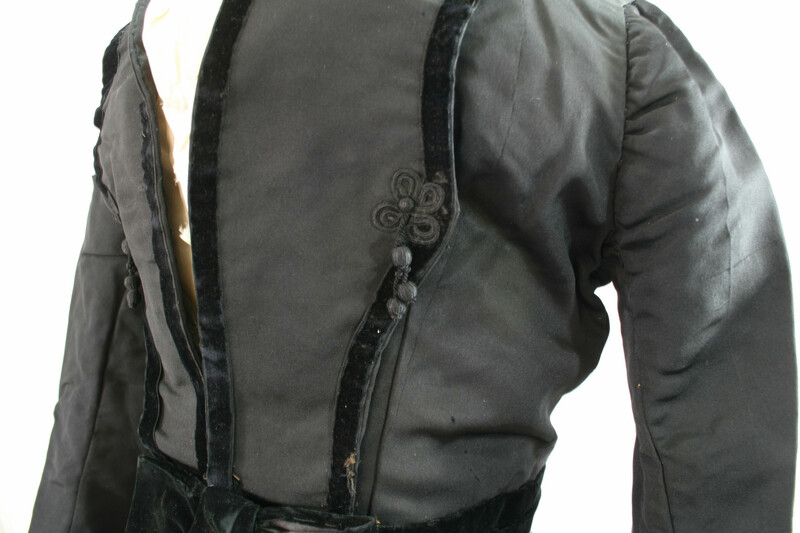 The front of the bodice with the collar open and the chemissette pulled aside. The lining fabric closes with hooks and eyes.